Habita,in the open waters of Central Africa, mainly in the rio Congo, which is where larger parts are given, We also find, Sanyati in the Zambeze and rivers which are tributaries of Lake Kariba, on the border between Zambia and Zimbabwe. The best month for fishing in the river is October Sanyati,when the big fish Tiger migrate into rivers, from hundreds of square kilometers that make up the Lake Kariba. They can reach about 2 meters long and 70 kg. 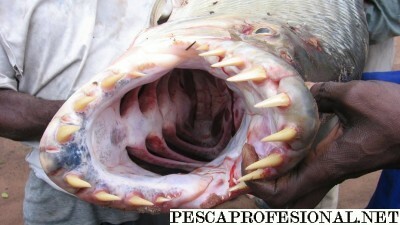 The fearsome tiger fish jaw, It houses a total of 32 overdeveloped teeth, located on the outside of the same, 18 in the upper jaw and 14 in the bottom. They are extremely sharp able to cash cut steel sisgas fishermen. Like the shark, It has teeth replacement,which they are located behind the functional teeth in the jaw cavities. If a tooth is broken fish ,during a violent attack,tooth replacement,Located in the jawbone exactly the opposite, tour to take the place of the first. It feeds, fish both dead and alive, in fishing areas it is widely used,Bunches of kapenta, they are small fish that are part of the natural diet of fish tiger. As for its fishing, It can be used both natural baits, like any type of artificial lure, pikies large and undulating spoons, always give good results, everyone always provided good hooks and reinforced anchors, to hold his powerful teeth. The sisgas employed must have a large diameter at least a couple of millimeters to avoid losing them when in contact with cutting teeth. 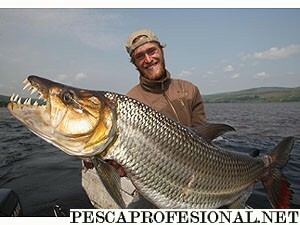 The truth is impressive to see that people fish that size of fish. The pezca seems to me something beautiful and that everyone should probrar. I congratulate the great fishermen Photo. If they can continue to rise more photos, regards. HOW INTERESTING SPECIES AND SHOCKING we have in our world, We not end up with these specimens. So before my ,Tiger fish is beyond doubt a mutation between crocodiles and chemicals used by prospectors and diamonds of high river basins,However in adobo and papillotes with almonds they are good and are not repeated as anchovies in vinegar. Without tooth loading the animal!! I'll either in the water with..